WASHINGTON (Reuters) - The idea of a second Brexit referendum is very likely to be put before Britain's parliament again although the government remains opposed to any new plebiscite, the British finance minister said on Friday. 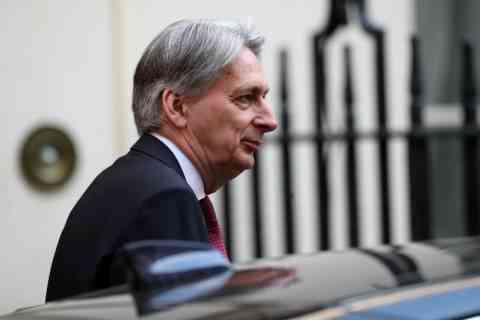 Philip Hammond said he hoped parliament would break the Brexit impasse by passing a deal by the end of June, potentially ending the calls for a new referendum, and there was a "good chance" of a breakthrough in talks with the opposition Labour Party. "I remain optimistic that over the next couple of months we will get a deal done," he told reporters in Washington where he is attending meetings at the International Monetary Fund. "It's a proposition that could and, on all the evidence, is very likely to be put to parliament at some stage," Hammond said. Hammond said about six months would be needed to hold a referendum, so if parliament voted in a couple of months' time to make one a condition of approving a Brexit deal, there would be no time before Britain is due to leave the EU on Oct. 31. One of May's most pro-EU ministers, Hammond has faced criticism from Brexit supporters for saying Britain should stay close to the bloc. He angered them again recently by describing another Brexit referendum as a "perfectly credible proposition". "(A second referendum) in the end is an issue about parliament and parliamentary numbers, and where the Labour Party ends up on this, as the Labour Party itself is deeply divided on this issue and at some point will have to decide on where it stands," Hammond said. Hammond said the risk of a no-deal Brexit had been reduced but not averted by this week's delay of Britain's exit and such an outcome would be felt in the global economy. Ending the uncertainty would "unleash the very large stock of potential investment that is hanging over the UK economy in suspended animation," he said. Bank of England Governor Mark Carney said on Thursday that Brexit had pushed business uncertainty "through the roof". "There may be some candidates who might be deterred from an application because of the political debate around Brexit, which inevitably the governor of the Bank of England can’t avoid being part of," he said.